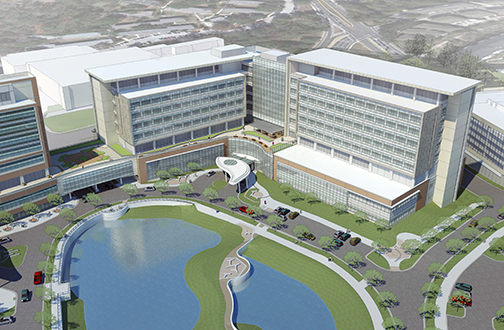 The UF Health-Shands Academic Medical Center will be located on a 15-acre site bounded by Archer Road, SW 13th Street, and SW 16th Avenue. Site improvements include: a parking garage, Energy Center expansion, site circulation and hardscape, stormwater, and complete on-site utilities. Offsite design includes roadway improvements to SW 13th Street from Archer Road to SW 16th Avenue. Offsite improvements will also include roadway re-construction sidewalks, drainage, and utilities. CHW is providing surveying, public facilitation, civil engineering, Green Building, permitting, and construction engineering inspection services. All four of our professional disciplines are being utilized. 3D Rendering provided by Flad Architects.